Fat City (1972) is an American boxing drama film directed by John Huston. The picture stars Stacy Keach, Jeff Bridges, and Susan Tyrrell. 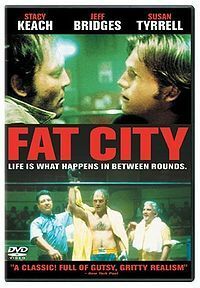 The movie, one of John Huston's later films, is based on the boxing novel Fat City (1969) by Leonard Gardner, who also wrote the screenplay. Tyrrell received an Oscar nomination as the alcoholic, world weary Oma.